Overseas Filipino workers are disappointed in the Labor Secretary Silvestre Bello III self-centered decision. 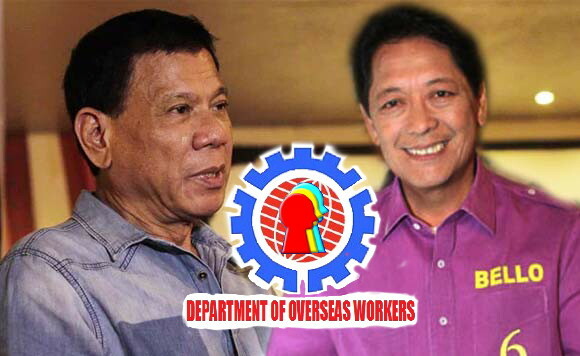 The Labor Secretary ruined the very hope of every OFW scattered around the globe when he opposed the plan of building a one-stop department that will focus solely on the needs and interests of Filipino overseas workers. Bello reasoned that such department is not needed. The secretary added that Filipinos must stay only in the Philippines building such agency is not worth considering. "Don't go working abroad", is that what you want to say Mr. Secretay Bello? He mentioned that while Filipinos chose to work abroad, these people are more likely to abuse by foreigners. Also, building a separate department for OFWs simply means that government is driving more Filipinos to work overseas. Bello Rejects Department of OFW! With his egocentric perception, OFWs have a few question for Labor Secretary Silvestre Bello III. First, are there enough jobs for Filipinos here in the Philippines? Affirmatively, the answer is NO. In any case, these reserved jobs are incompatible to their expected goals. In terms of compensation, skills, and experience a low-paying jobs can't benefit a working Filipino. This will only worsen the statistics of underemployment in the country. Filipinos have different professions, hospitals can't hired all these vast numbers of nurses. What about those engineering graduates, laborers and skilled workers? These people are looking for a deserving income. Not to mention the highest population of OFWs are sea-based. Government can't provide jobs for thousands of seafarers and cruise workers in case they choose to remain in the country. The 2015 record shows that there are an estimated 400,000 seafarers were deployed overseas. Can Philippine economy survive without the help from OFWs? Have Secretary Bello forgotten the recession experienced by many countries several years ago, where the Philippine able to withstand such crisis, thanks to the remittances from OFWs to their families. In 2015, OFW remittances reached an estimated $25.61 billion while in 2016 it grew to much higher $26.9 billion. Duterte government prioritizes the welfare and interest of more than 10 million OFWs, is Bello trying to contradict the good intention of the president? The administration plans to create a one-stop office that solely offer services concerning the needs of OFWs, speeding up the passport processing system, eliminating overseas employment certificate (OEC), and the quick systematic repatriation of Filipinos who were lost their jobs in the Middle East. And finally, whether the grand secretary admit it or not, no matter what kind of job offer laid by the government and private sector in the Philippines, most Filipino prefer to work in other countries where it gives them a much considerable salary. Only to promote his ambition to stamp out Philippines from having a title of overseas worker/domestic helper capital of the world. The secretary refused to carry on the President Duterte's plan of having agency that caters only OFW's interest and safety. With the huge contributions of OFWs to the country's growth, now is the time for the government to show the gratitude by building a separate department for Filipinos working abroad. Hopefully, the Labor Secretary Bello retract his decision, stop withholding the privilege of having the agency to assist Filipinos working abroad, and ratify the existence of OFWs. Boost your mind with answers to questions you never thought to ask. Packed with more educational stories than ever before. Kwentology provide fast facts, up-to-date information, and notable news in every pages. Plus games, trivia, and more! Thank you for reading Editorial | Philippine Labor Secretary Blocked the Creation of Department of OFW posted on the website Kwentology if you want to redistribute this article please include the link as the source. Have some kuwento to share? Contact us!